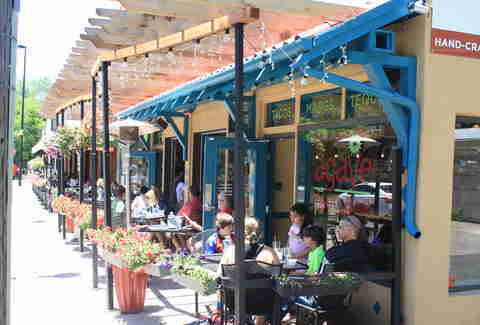 This neighborhood place in south Denver should be your go-to spot for intense Denver sunshine and $3.50 margaritas. 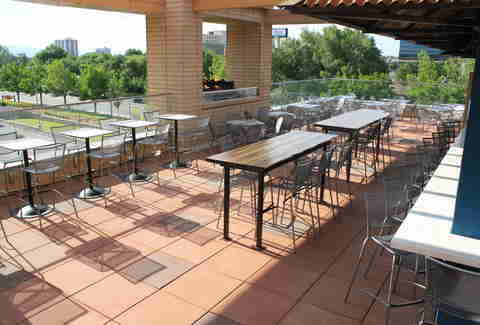 The patio around this DU watering hole offers plenty of space that makes competing for seats with college kids a little easier, especially if you show up at 3pm for the start of happy hour and avoid the riff raff. The drinkery in the RiNo neighborhood prides itself on a few things it does best: creative art installations, innuendo-heavy menu items, and the importance of fresh air. The sizable side patio offers up quality seating for those who need a break from the whomp-whomp the DJs are spinning on the inside. The patio at Kaos Pizzeria is molto bene! Meaning it's Italy incarnate with its lush vine-adorned walkways, cobblestone paths, and patio kitchen that fills the air with aromas of fresh baked Neapolitan-style pizzas. More than 30 different styles of classic Italian pizza grace the menu from prosciutto to Margherita and a local brew list from Odell, Left Hand, and Prost doesn’t hurt the atmosphere either. Vita is the type of place that makes you wish you had 50+ friends. 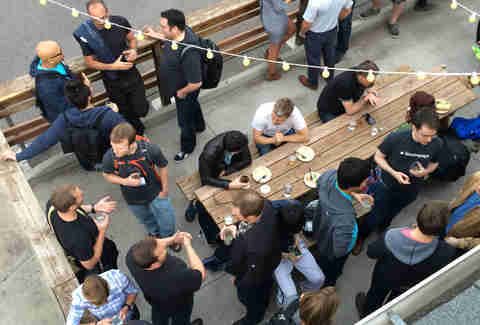 Its patio offers the space for such social groups and a bar program that is sure to please any and everyone. Grab a classic Manhattan or martini from the conveniently placed patio bar that’s mere steps away from just about any seat. 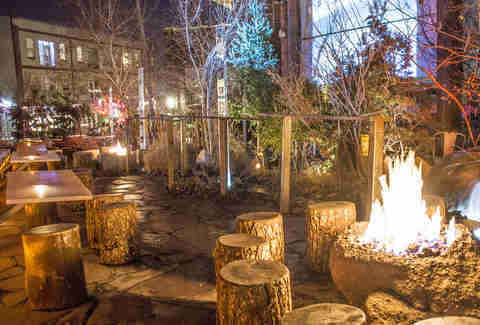 The patio at Forest Room 5 is as much as a wild life refuge as it is an outdoor seating area. There are fire pits, babbling brooks, and secluded tree-lined alcoves that make your forget you are actually in the Lo-Hi. One of Downtown Denver’s best dive bars, Star Bar has a decent patio artfully hidden from view of the passing public. Grab a beer from its killer rotating beer list and head through the back door to experience urban drinking at its finest. When the nights are really going, a patio bar opens up for easy-access drinking. Hidden high above Broadway is Yazoo Barbeque Company's upstairs patio. High walls control the bustle of the streets below but allow for plenty of sunlight to shine down on your BBQ-stained face. The space is even equipped with a full bar that few are even aware of! 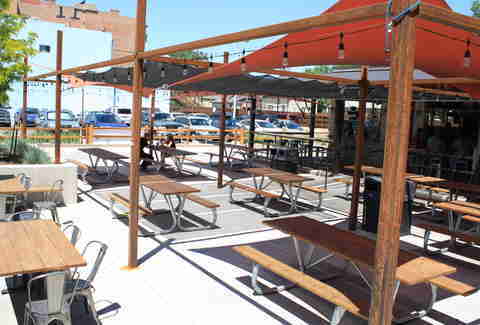 Agave Taco Bar in the Wash Park area has its patio as priority number one. It offers up as much seating outside as it does inside and it's all furnished in appropriate cantina décor. Tavern Uptown offers up one of the largest patios in Uptown and enough TVs and sports packages to make watching the game anywhere else unnecessary. Cold pints of beer and bar fare are what you can expect and a landscaped back patio offers up an environment that makes drinking outside while kind of being inside so enjoyable. The polished dive bar in Uptown Denver is as pretty on the outside as it is on the inside. The patio is hidden from all but a single door on the back wall that opens into a quality outdoor space with an ever-changing graffitied wall supplied by a local artist. It conveys a space for deep thinkers and passionate light beer drinkers. 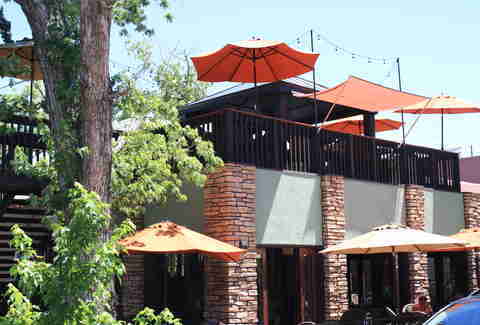 The Thin Man is a drinker’s bar and the patio makes it an outdoor drinker's bar. The space is large and the seating doesn’t get fancier than a ripped out backseat from a van. But once you pass through one of the most stylish dive bars in Denver, you actually prefer it that way. When the brewers at OMF opened, they knew they had to have a quality and intense patio that was on par with their quality and hoppy-flavored beers. Just off to the side of the main entrance, the patio at OMF unapologetically offers no shade so all that skin-searing Colorado sun can beat down upon your brow. It’s actually quite nice. Strolling by the Populist, one can't help but want to be on its patio. With a modern and industrial design at its heart, it invokes all the best parts of the RiNo district. It could also be its Colorful Ranch Beef Burgers or sausage and cavatelli that everyone is eating. Whatever the case may be, you desperately want an invite to that party. 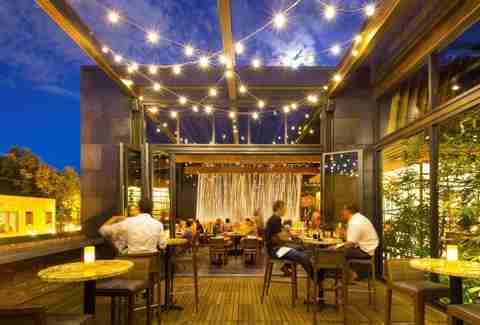 Getting on the patio at Tamayo is the start of a good time. 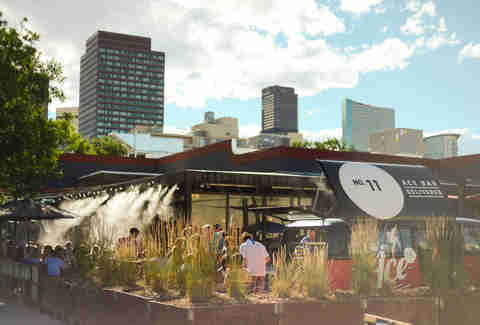 The Latin-heavy menu -- artfully commanded by Richard Sandoval and featuring items like Pepito Steak Wraps -- will put the spice in your life and the breeze of a calm Denver wind will cool you down. Order up some Mercado Margs that use passion fruit purees and you will probably never leave. 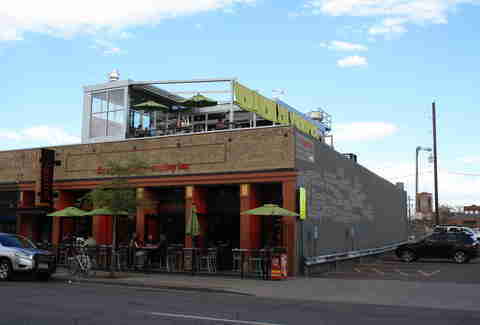 RiNo is already one of Denver’s most popular neighborhoods to eat and drink in and The Matchbox on Larimer is one of the “drink-in” places. It also happens to have a great patio that is large enough to hold a party and seclude you from the throngs of people who are spending their evenings in the area. Vine Street Pub kind of has it all. 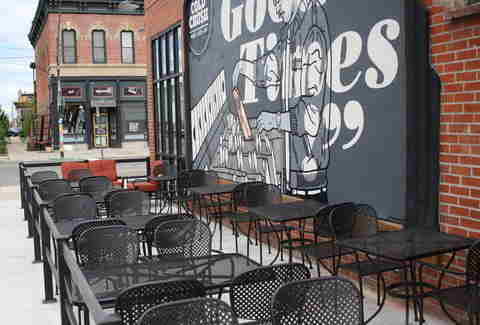 It could be its fine selection of burgers or even finer selection of house brews, but it’s really its patios that steal the show. The front offers a space to kick up the feet and the side allows for yard games and mingling room. This place is on fire! Ahooo! Ignite! is a burger bar that does not mess around when it comes to patio seating. The front patio is going to be fine and all, but it’s the party happening upstairs that’s the desired destination. 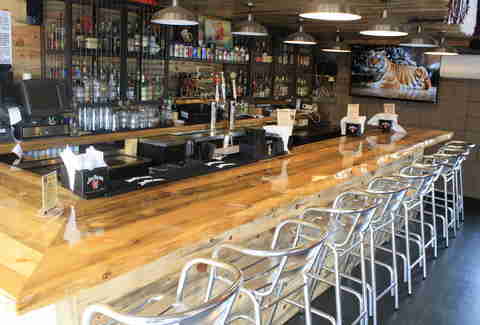 Outfitted with a full bar and the ability to order up some beefy deliciousness, Ignite! is how any sane person would want to spend their evenings. If this South Pearl resto seems homey, it's because it used to be, in fact, a residential home that was retro-fitted to “house” a low-down-cuisine-style restaurant. Along with major changes to the entire place, front, side, and rooftop patios were added, making all its pure cane sugar drinks come with a side of fresh air. Immediately known for the amount of beer this place has (duh! 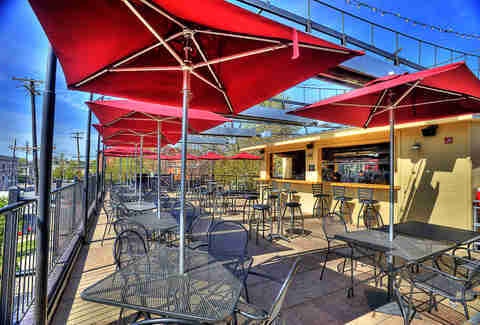 ), World of Beer also boasts a pretty amazing patio located in the middle of the City Set area of Glendale. While you are more than welcomed to have a Corona and lime, you are encouraged to try literally any one of the thousands of other brews it has like the recently tapped Green Flash Belgian Coast IPA. If you are going to throw “Big Backyard” into your name you better be packing some serious real estate in the rear. When you grab a cold one from one of its 12 rotating taps and maybe order up a round of fried mushrooms, make your way to the back and bear witness to one of the largest outdoor areas in the city. 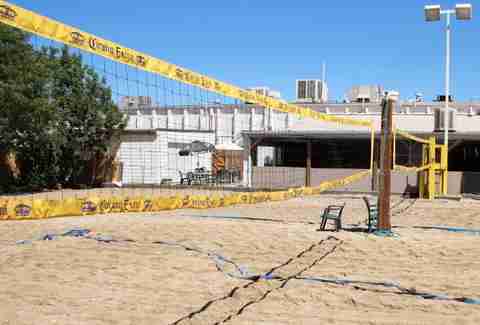 Gibby’s Big Backyard in Aurora not only has ample seating but it also has two sand volleyball courts for all your bump, set, and spike needs. The only thing you probably wish you had after eating one of Illegal Pete’s rather large burritos is more room for your expanding waistline, which is probably what they had in mind when they opened their South Broadway location a couple years ago. The patio is massive and offers up tables galore for you and your buds to gorge, regret, and repeat. 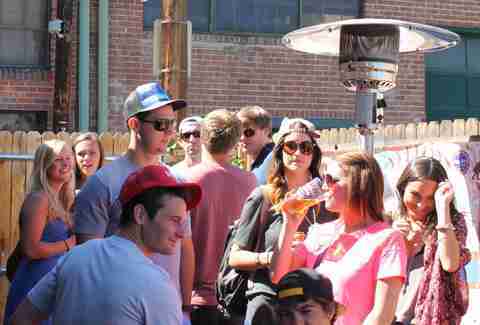 Pouring tasty suds and having one of the most pet-friendly patios in Denver is a winning combo for the guests of DBC. The always-busy and popular brewery is inspired by German beer gardens with large community tables to encourage... um, “community”? If that doesn’t start conversations, let your four-legged wingman work it's magic while you knock back some Sun Drenched Ale and get drenched in sun. The well-known “oldest bar” in Denver slings one of the best, greasiest burgers you can find anywhere and also has one of the most charming patios in Denver. High fences and rich vegetations offer solitude as you wash down bison burgers with pints of local brews and maybe discuss a Kerouac novel (that you’ve definitely read). 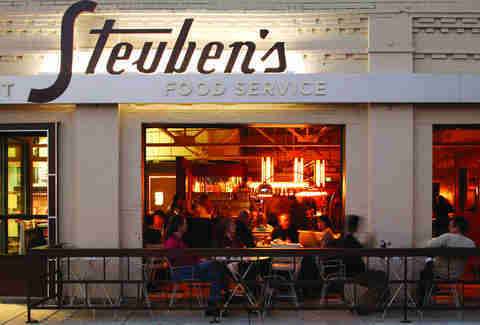 When you get a seat at Steuben’s* you should be happy, but when you get a patio seat, you should be ecstatic. The side patio it offers is pretty much the epitome of restaurant patios and the front seating area may be the best seat in the house for people-watching on 17th. 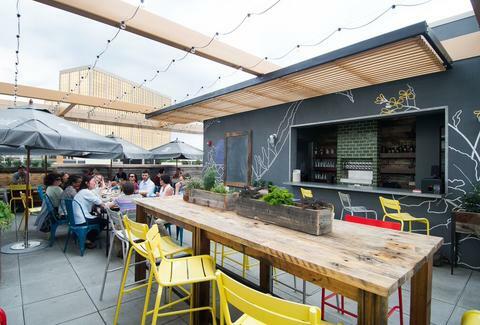 The rooftop patio at Los Chingones offers refuge from the ever-populated streets of the RiNo district. The space comes equipped with a bar that pops tops of Tecate, Negra Modelo, and PBR, which always pair well with its huge selection of tequila to sip or shoot, and a full food menu to satiate your hunger. The patio out front at the Kitchen [Next Door] might get you to the door alone. Who are we kidding? 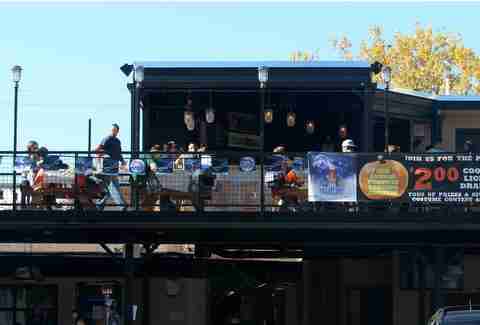 It’s those garlic smashers too, but the rooftop patio is what will have you posting up there for hours to come. The 70-seater is outfitted with a herb garden, well-stocked bar, and some of the best mountain views in town. 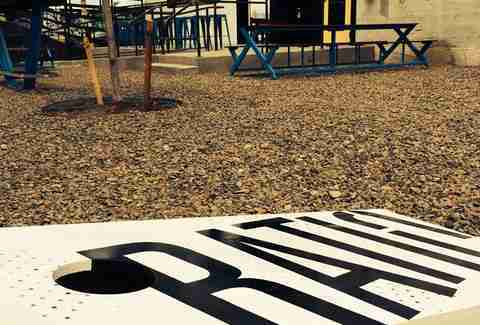 The beers at Ratio Beerworks are bringing in the fans, but the big, dog-friendly side patio is creating the regulars. The usual always-with-beer-in-hand yard games are available for constant entertainment and consumption, and both shaded and unshaded seats are there for your choice of sunny or not-sunny comfort. The elegantly designed interior of Izakaya Den makes it hard to break away, but if the interior looks so good, the exterior can’t fall short, right? Right. You won’t be disappointed dining on the sushi den’s patio in the alluring area of South Pearl. Feasting on the impressive sushi list of salmon, yellowtail, and tuna rolls and the humming bustle of pedestrians below create for a harmonious evening experience every time. 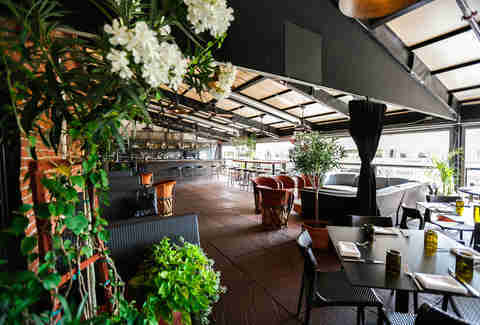 If given the opportunity to dine on the rooftop patio at Jax Fish House in Glendale, do not waste the opportunity, ever. Plenty of space accommodates the large rooftop area and it probably catches and releases into your stomach some of the best seafood in Denver, if not the state. The former mortuary is “killing” it (like they never heard that one before) when it comes to eating and drinking on the top of their massive restaurant. If the cheese-stuffed dates (aka, devils on horseback) don’t get you up there, sipping on one of the precisely crafted cocktails they serve up from their van/bar parked just feet away from the dining tables certainly will. This Asian resto/ping pong hall in the Uptown area of Denver is about having fun, so don’t be all stuffy and upset if a ping pong ball or two lands in your dim sum or pad Thai. Just chop stick that back over to one of the three tables it has on its large front patio and keep on going, man. 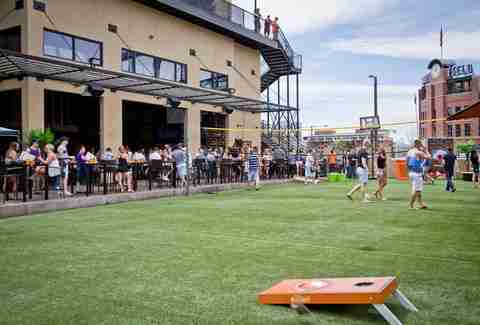 Front patios, side patios, rooftop patios, downstairs patios, back patios... the ViewHouse Downtown takes the cake when it comes to the outdoor scene in Denver. Each offers up something unique, so one experience can be drastically different from the next, ensuring you come back for more. *Editor's note: The author of this piece is currently employed by Steuben's, but we would have included it anyway because it's fantastic.